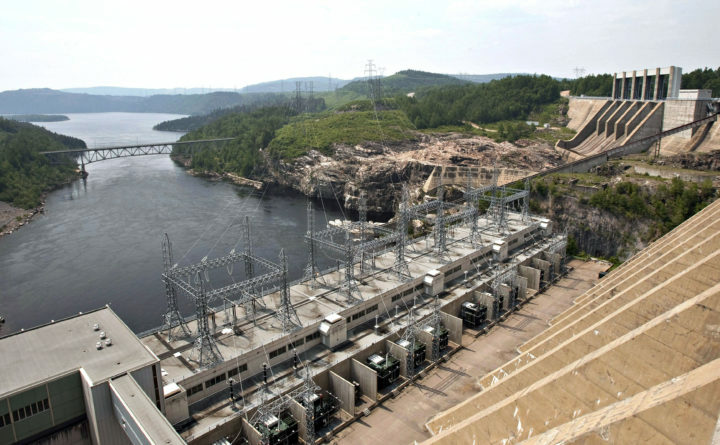 In this June 22, 2010 file photo, the Jean-Lesage hydro electric dam generates power along the Manicouagan River north of Baie-Comeau, Quebec. A proposed transmission line across western Maine to serve as a conduit for Canadian hydropower is "in the best interest" of state electricity customers thanks to incentives negotiated with Central Maine Power, the state's public advocate said on Thursday, March 7, 2019. During a special session, the three commissioners of the Maine Public Utilities Commission will either concur or disagree with their staff’s March 29 recommendation to grant CMP the needed certificate of public convenience and necessity for its project. It’s also possible they may come up with their own position on the project, experts said. The staff’s Examiners’ Report endorsed the project and a stipulation with more than $250 million in benefits over 40 years for the state and towns along the route. Gov. Janet Mills supports the stipulation. CMP’s New England Clean Energy Connect, or NECEC, project will bring hydropower through a 145-mile corridor, 53 miles of which are through areas in western Maine that would require building new transmission infrastructure. The Examiners’ Report drew comments from nine intervenors. Six of the parties asked the commission not to grant the certificate, while three asked that it be approved. ReEnergy Biomass, the Natural Resources Council of Maine, the town of Caratunk, NextEra and Phippsburg resident Dot Kelly asked that the certificate be denied. Attorneys for power generation companies Calpine, Vistra and Bucksport Generation filed their opposition to the project together. CMP filed for the project to be approved. The Industrial Energy Consumer Group and the Western Mountains & Rivers Corp. each supported the project, but requested some modifications. The IECG asked the commission to adopt the Examiners’ Report, but asked that it modify portions dealing with scenic and recreational value. The report found that an above-ground transmission line running through the 53 miles of proposed new corridor would have a considerable and detrimental impact on the recreational value of the area, the associated tourism and the local economy. “IECG urges the commission to tread this ground with great care, as the commission’s statements can have unintended consequences far beyond this proceeding,” the IECG wrote. The Western Mountains & Rivers Corp. said the commission should grant the certificate and approve the stipulation. However, it asked the commission to omit parts of the report relating to a memorandum of understanding between it and CMP. The group in June 2018 agreed to a $22 million deal with CMP for conservation projects to mitigate the negative effects on the scenery around the Kennebec River Gorge. Both NextEra and Kelly contended the Examiners’ Report is flawed and that the certificate not be granted. Thursday’s meeting comes on the cusp of possible changes in the make-up of the commission. Chairman Mark Vannoy’s term expired at the end of March. Mills has not yet nominated a replacement. Vannoy, an engineer, was appointed in May 2012 to finish the term of Vendean Vafiades, and then reappointed in May 2013. He was appointed chair of the commission in December 2014 by former Gov. Paul LePage. The two other commissioners are R. Bruce Williamson, an economist appointed to the PUC in June 2015, and Randall D. Davis, a former energy operations manager at Sappi’s Somerset Mill in Skowhegan, who was appointed in September 2017. Williamson’s term expires in March 2021 and Davis’ in March 2023. The three commissioners, appointed to staggered six-year terms by the governor, are subject to review by the Legislature’s Energy, Utilities and Technology Committee and confirmation by the Maine Senate. Correction: A previous version of this story misspelled the name of power generation company Vistra.